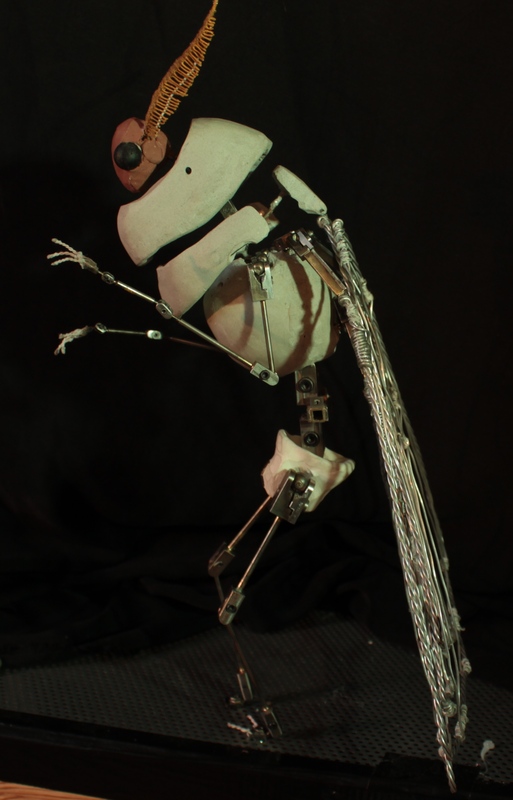 I was commissioned to build this puppet for an NFTS graduation film. 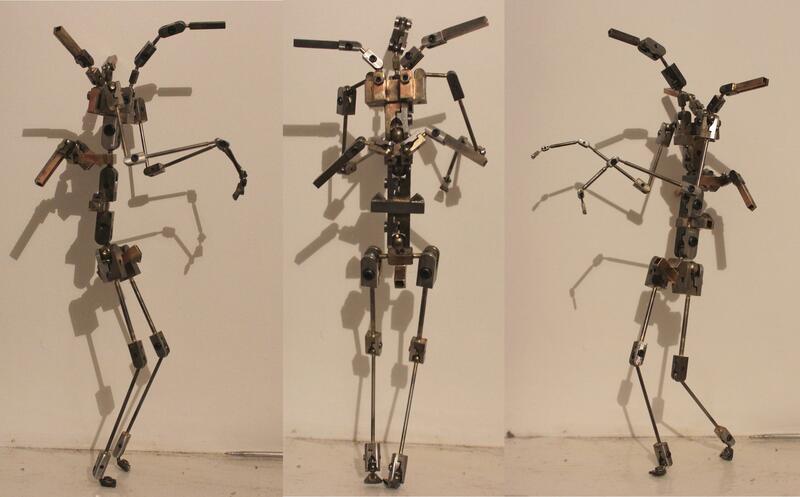 I constructed and partly designed the ball and socket armature which was commissioned through John Wright Modelmaking. 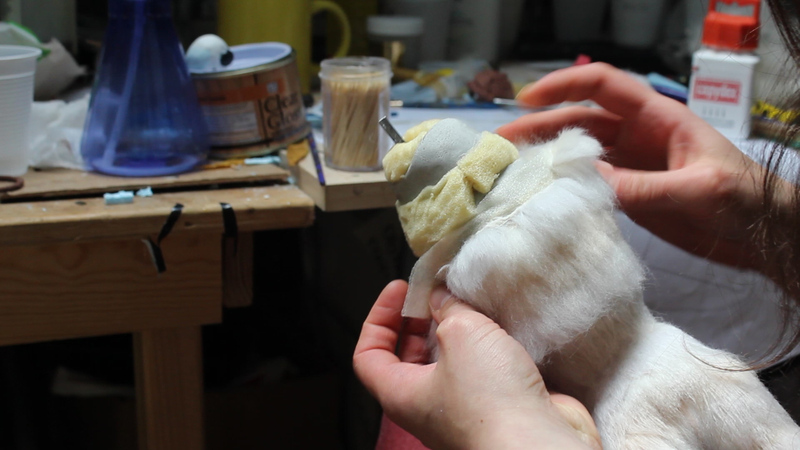 I then finished the rest of the puppet which included hollow resin casts, silicone moulds, plaster moulds, silicone casts, needle felting, flocking and other fabrication methods. 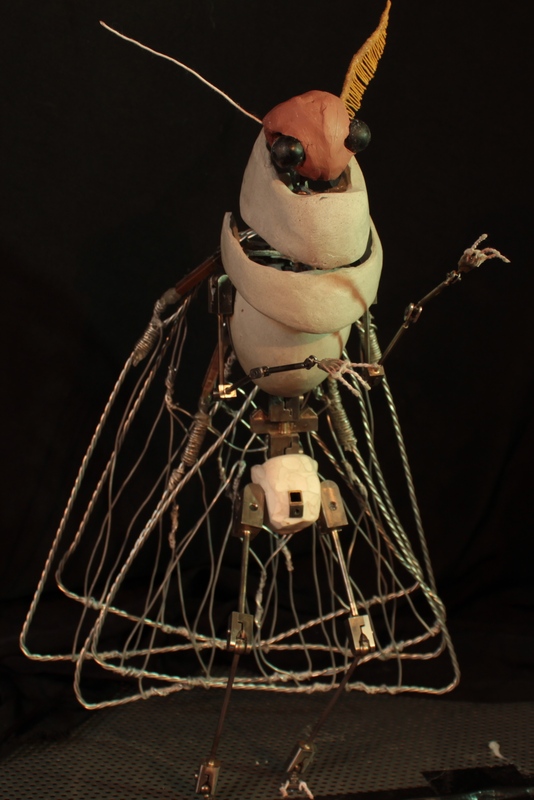 A lot of different processes and methods went into making this puppet. 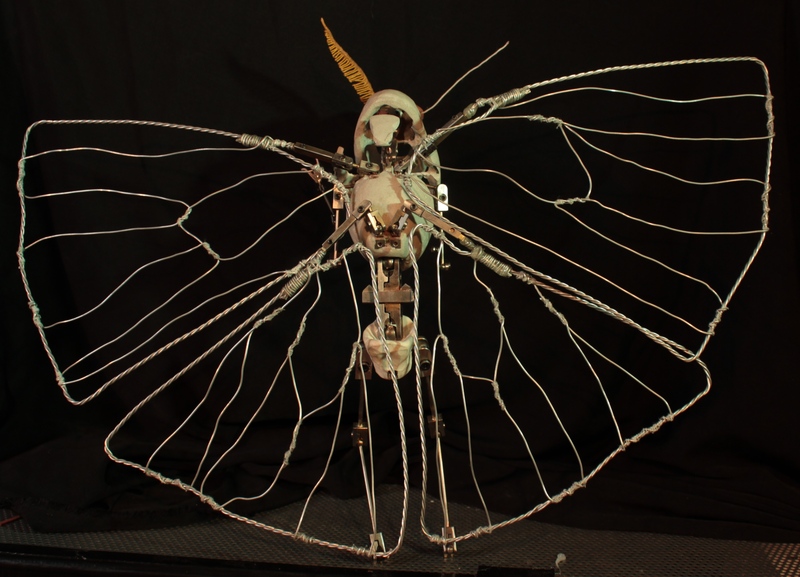 I have broken down the image galleries into different stages of the build. 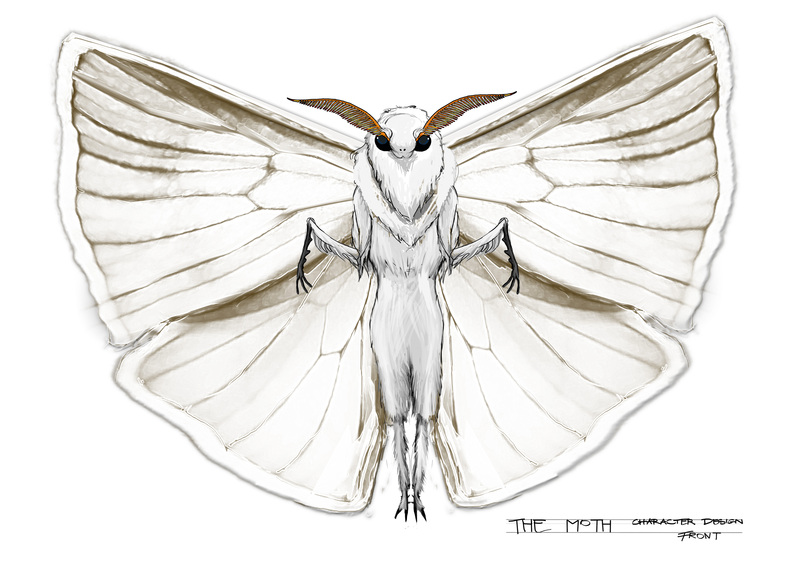 Below are the initial designs I was sent to work from. 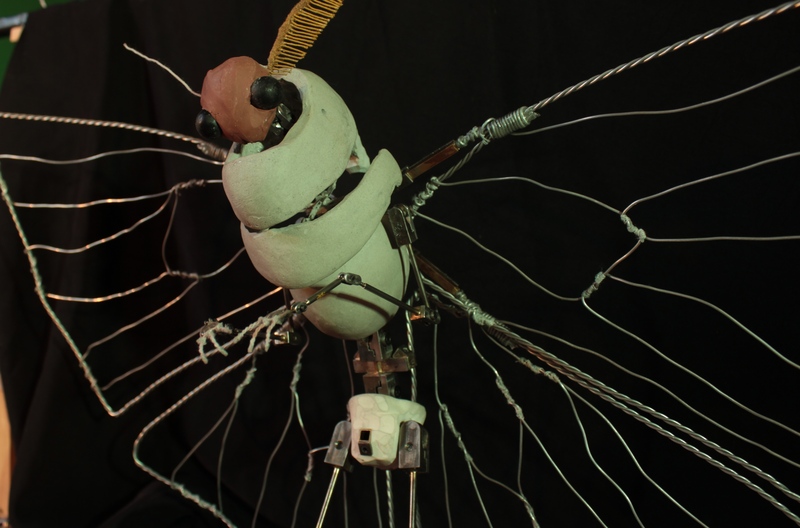 John Wright designed the initial armature based on the concept drawings, and I later adapted these to incorporate the wing armature parts and some neck adaptations. 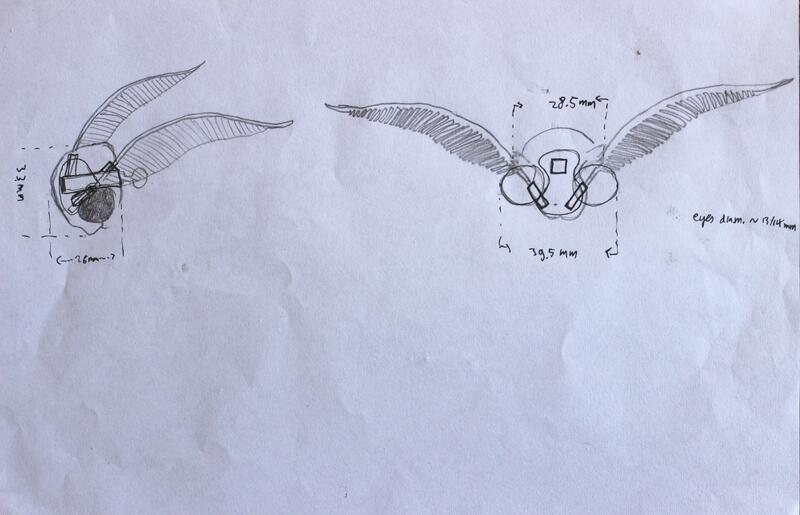 Below are a few examples of technical drawings I used and made during the process. Technical drawings working out design and measurements for the wings and resin core sections. 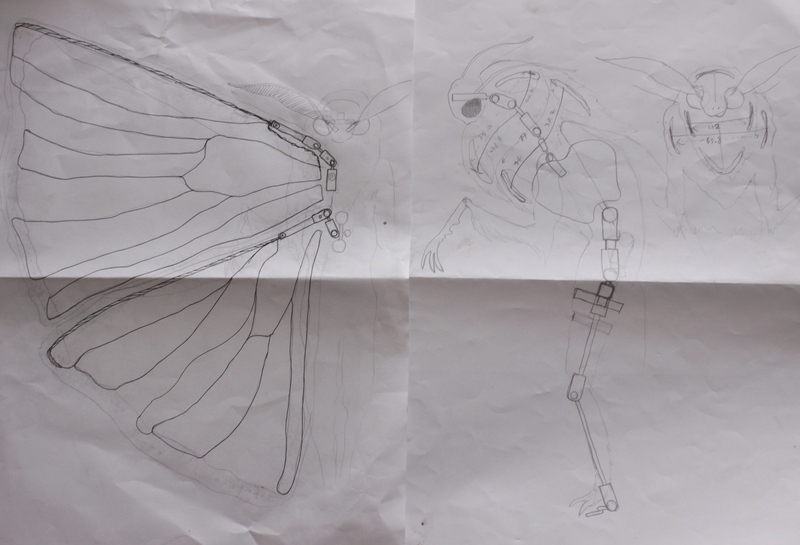 Armature drawing by John Wrights with my notes and sketches, yet without details on the wing sections built into the torso. 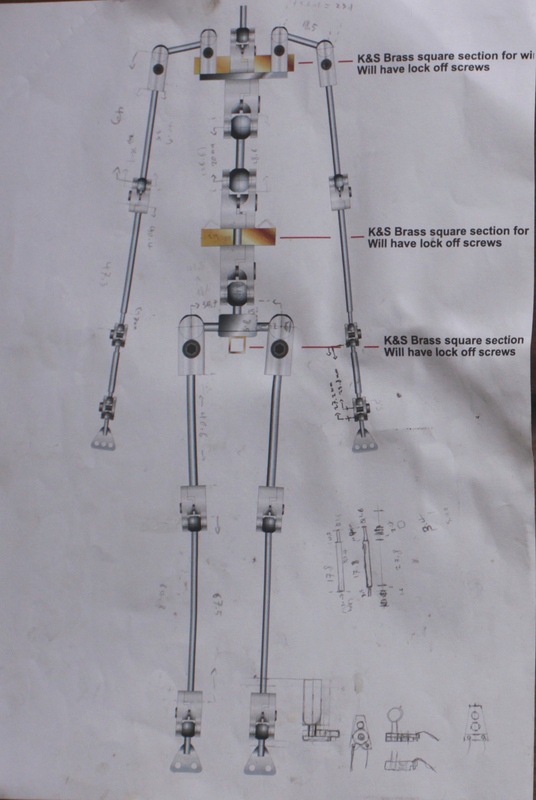 Head technical drawing, working out position of eyes and K&S for antennas. 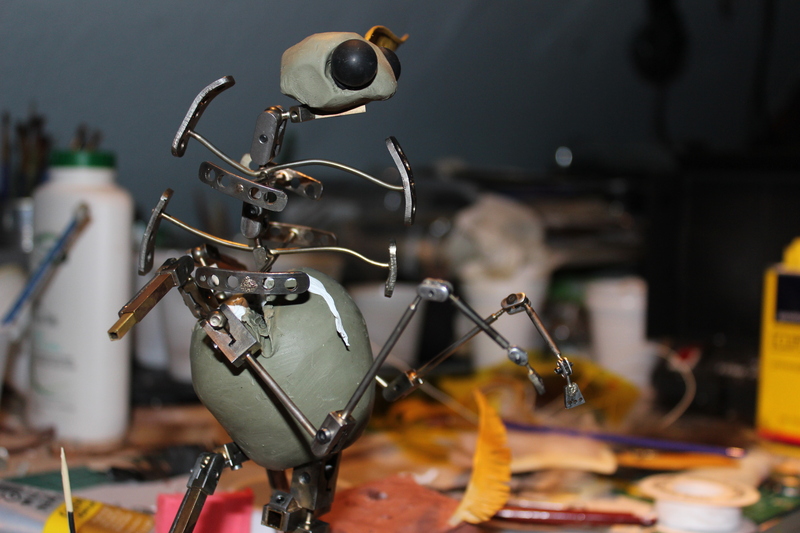 After the main ball and socket armature was built I realized I needed to add some more metal structure around the neck to support the hollow resin core parts I designed to be under the bulky neck. 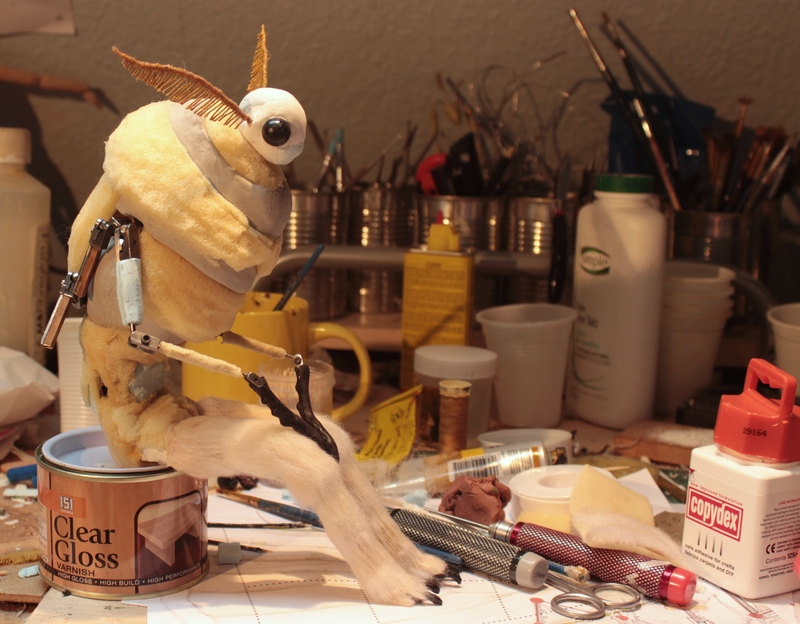 The hard resin parts make it possible to add the furry exterior while still being able to access all the joints inside the armature, and with minimal distortion of the fur layer during animation or constraint of the joints, as well as keeping down the weight of the puppet. 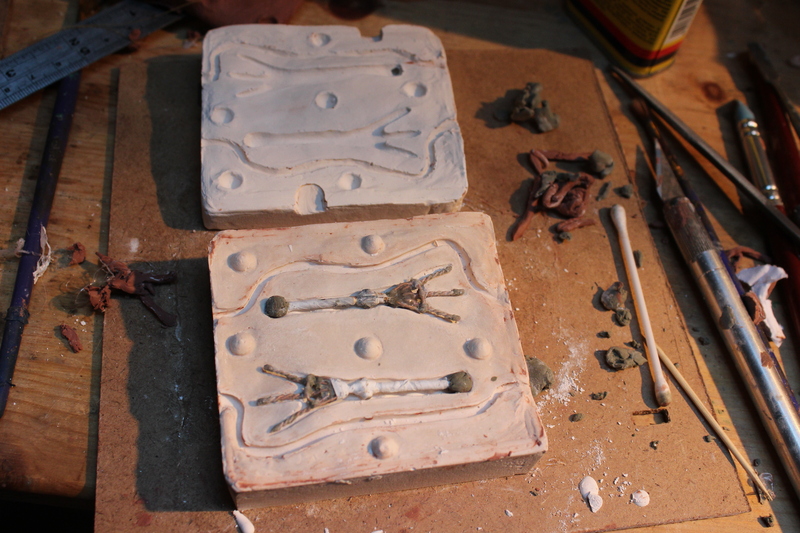 All the core pieces sculpted in chavant clay around the metal structures, ready to take apart and mould. 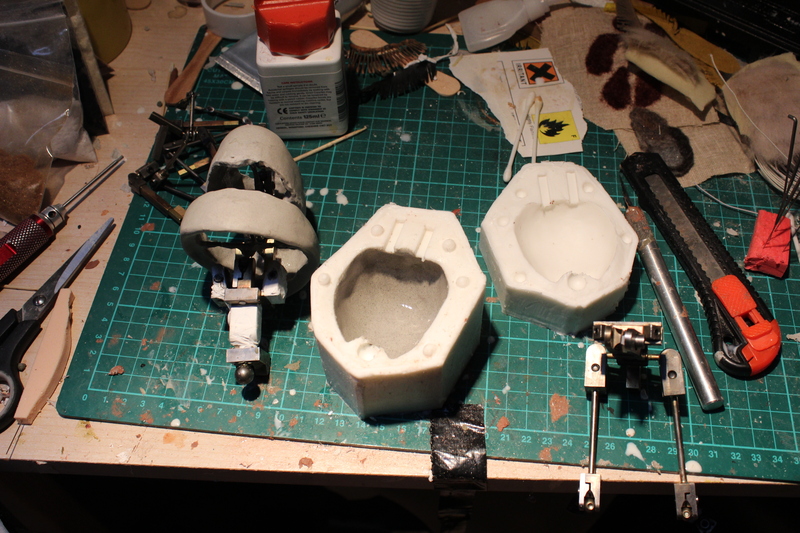 Silicone moulds for the two neck pieces with armature section inside, ready to cast. 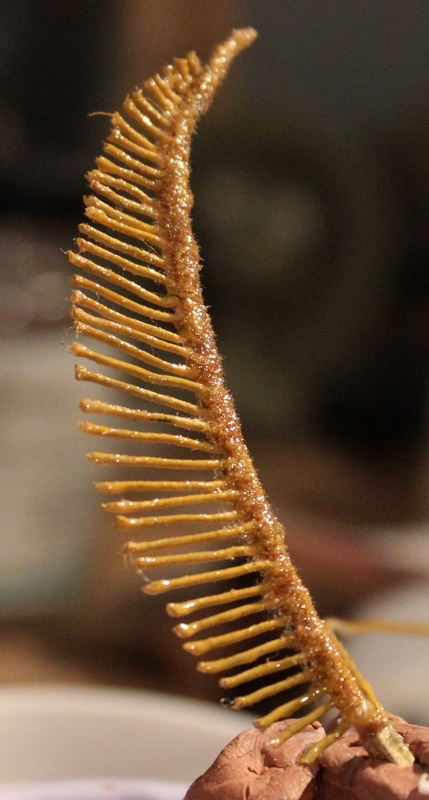 Resin casting in progress. 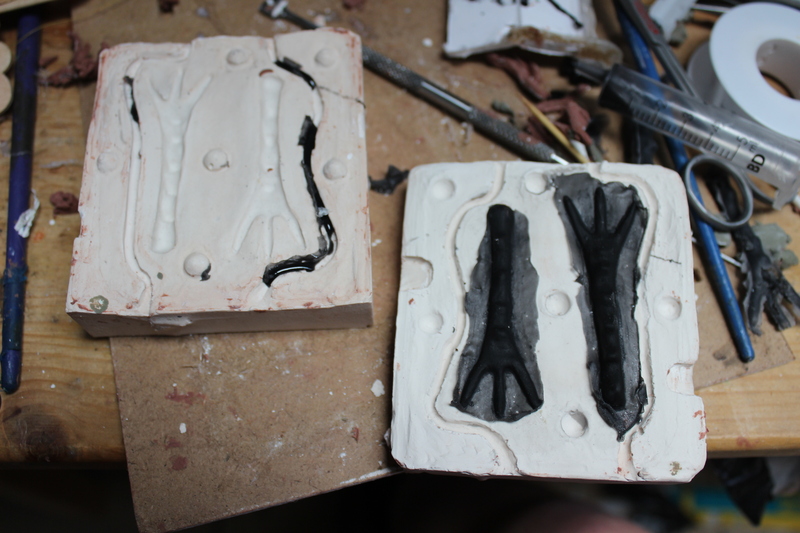 Neck pieces are cast, the torso piece is in two parts. 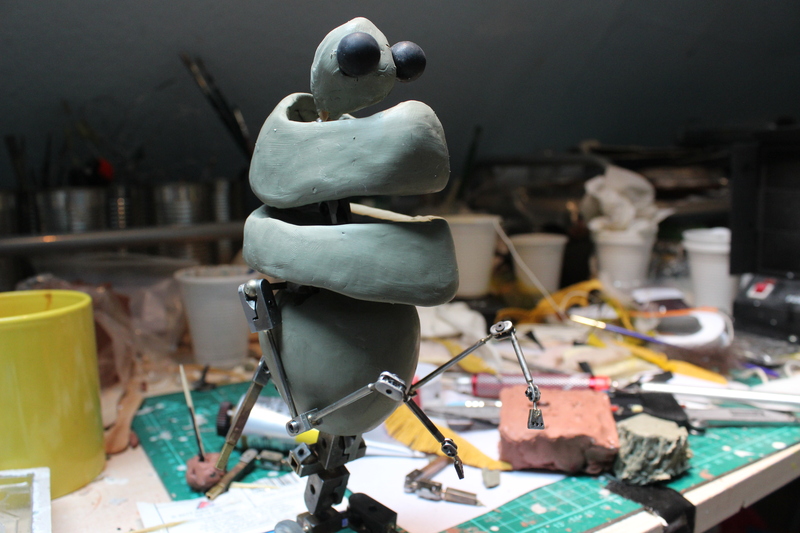 The armature will be cast into the resin. 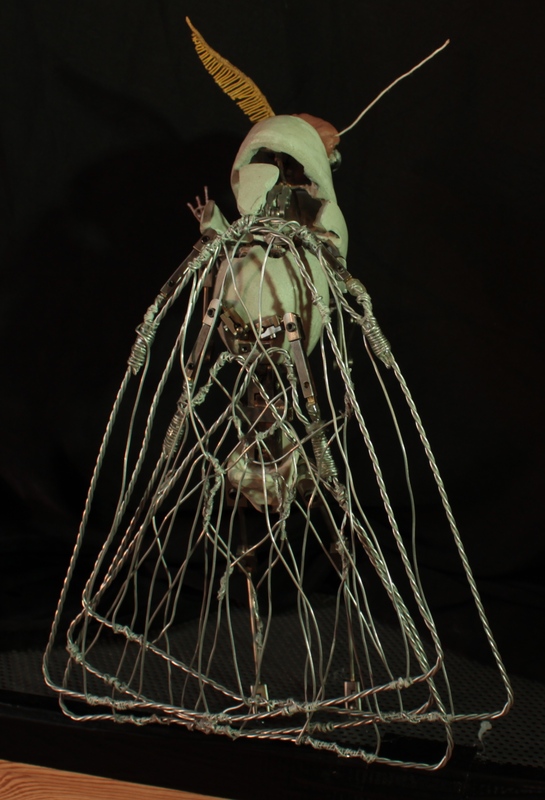 See image gallery below for further images and details about the fabrication process after finishing the armature and core parts. 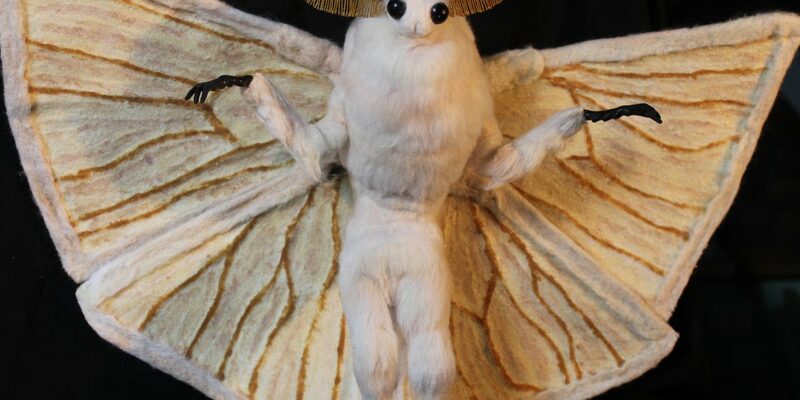 These include making the silicone claws, the antennas, flocking the inside of the wings and the process of applying the needle felting wool as fur on the body as well as felted for the outside of the wings. 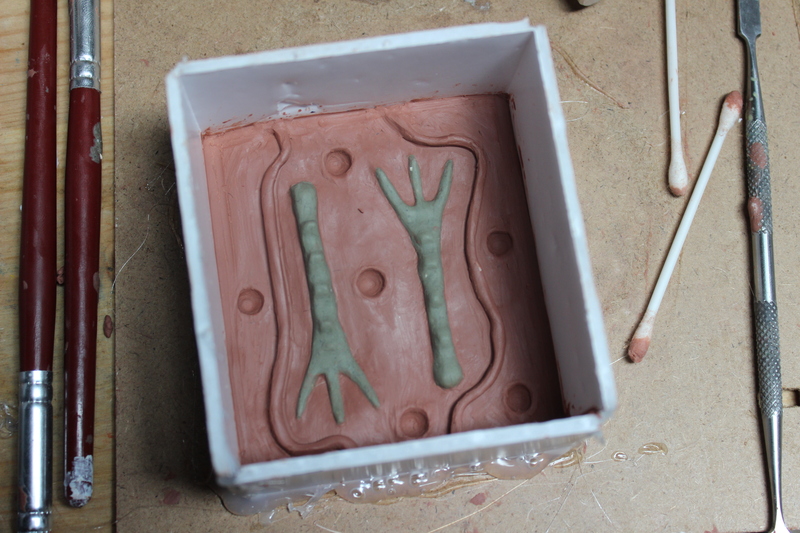 mould set up for the moth’s claws, sculpted in Chavant clay, to be cast in silicone. 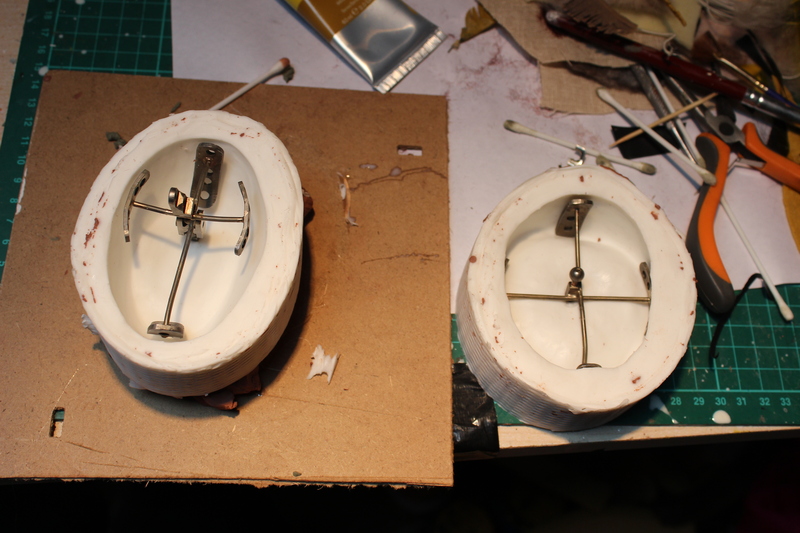 Finished two part plaster mould with the claw armature part inside, ready to be cast in silicone. Finished silicone cast of claws in mould (before trimming). 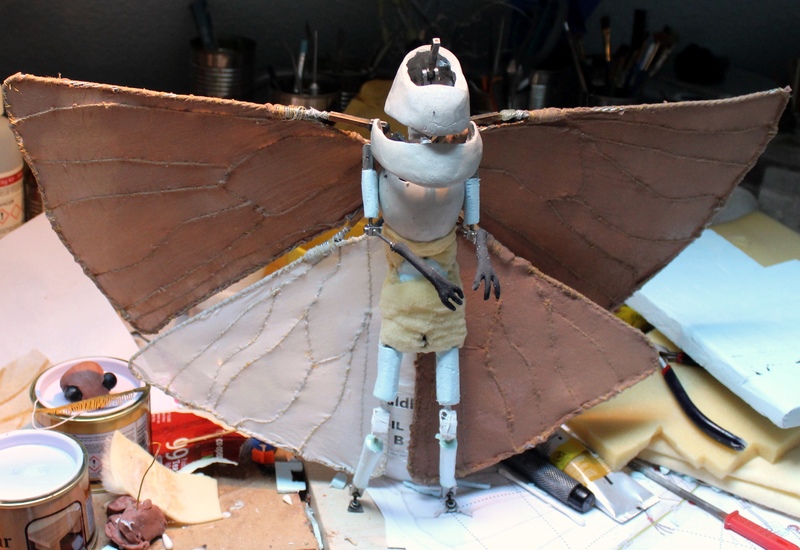 Armature partly covered with hard and soft foam, wings covered in tights. 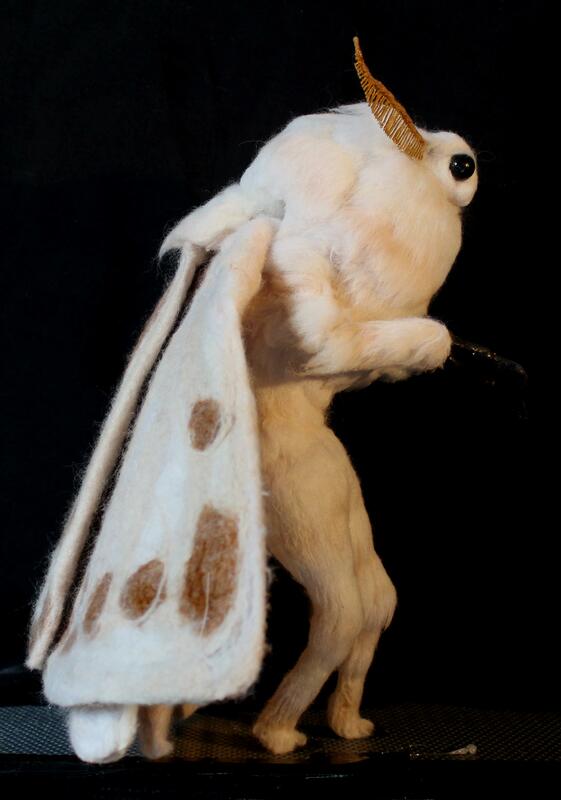 moth armature fleshed out with foam, with finished antenna and claws, legs partly covered in fur. 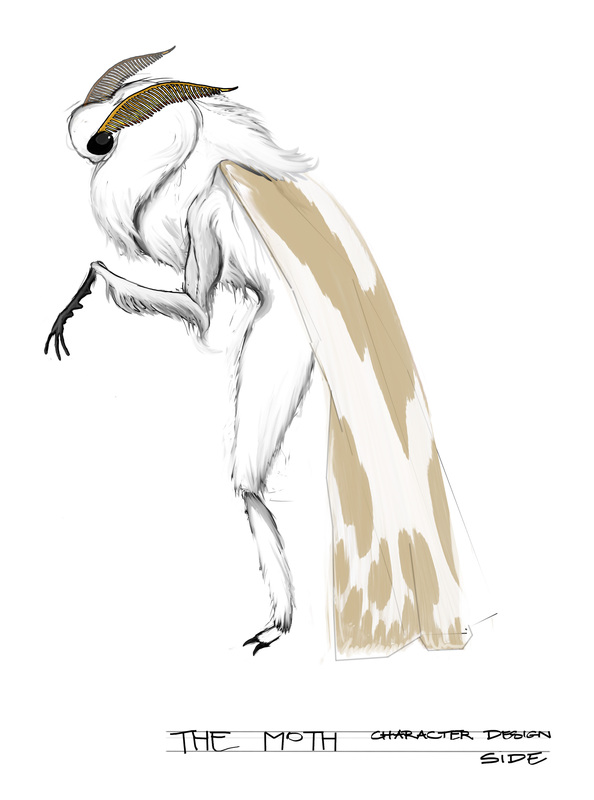 fitting pieces of fur onto the body. 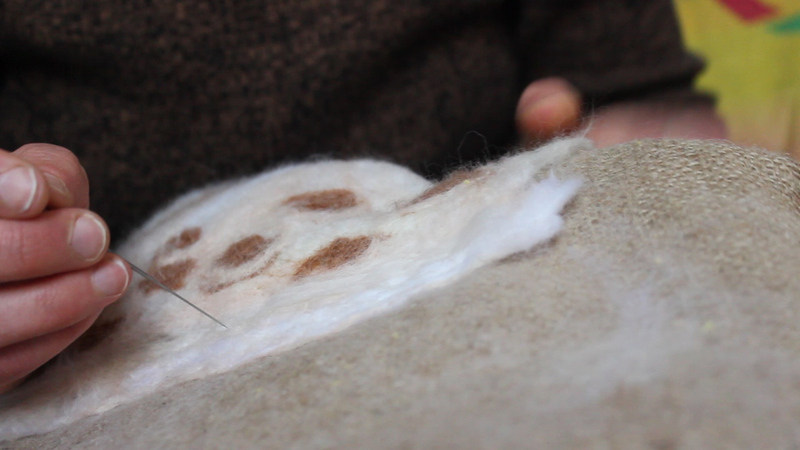 I made the fur from needle felting wool that was attached row by row onto pieces of thin foam, then brushed and treated. One of the antennas. I tried various methods to give these the desired look. 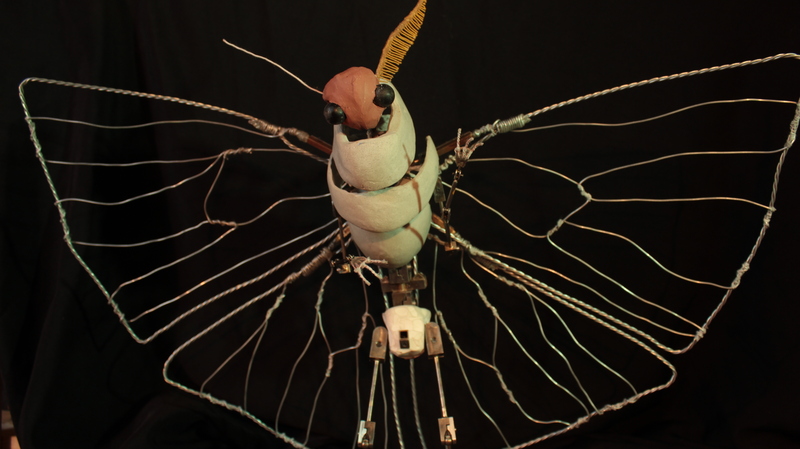 The antenna is made from cotton covered wire, painted and flocked and treated with clear varnish to give it some shine. 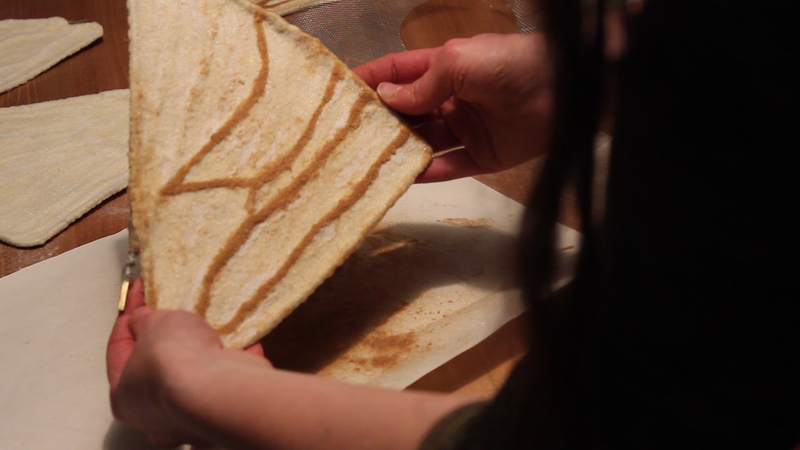 flocking the inside of the wings. 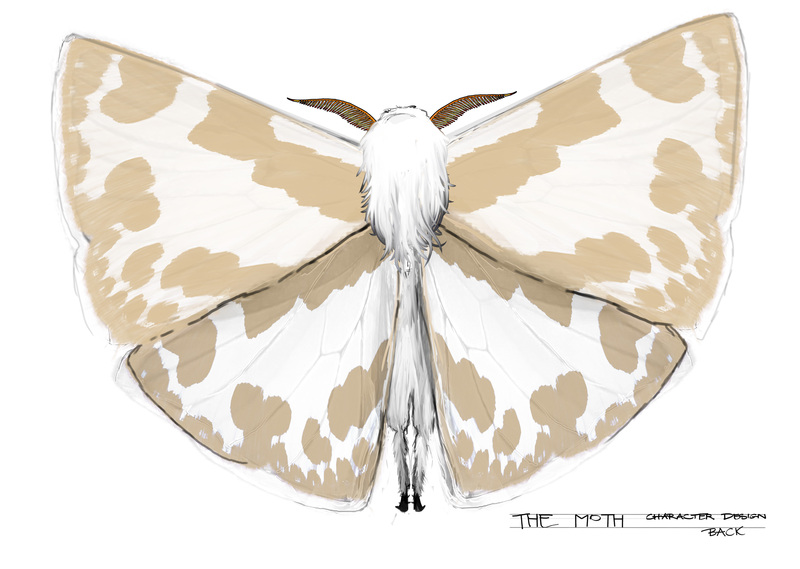 I applied flocking fibres of different colours onto the tights covering the wings. 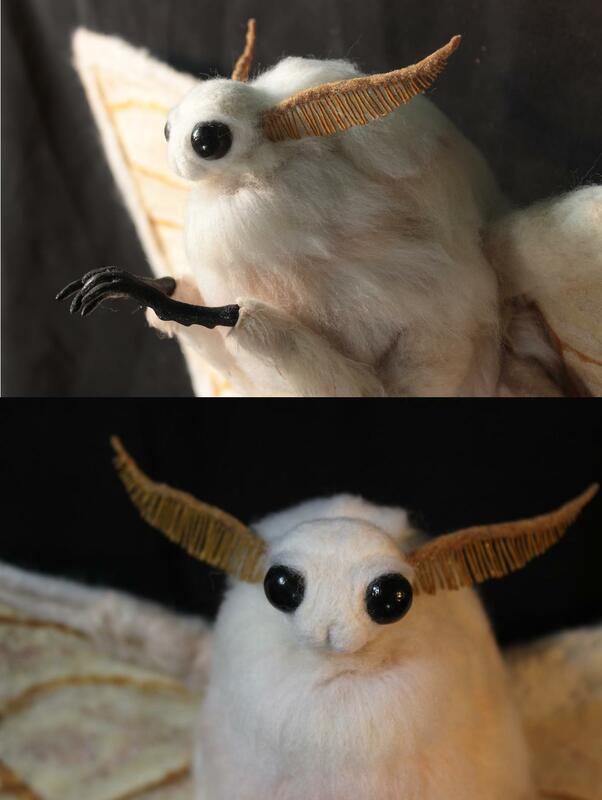 needle felting the wings. 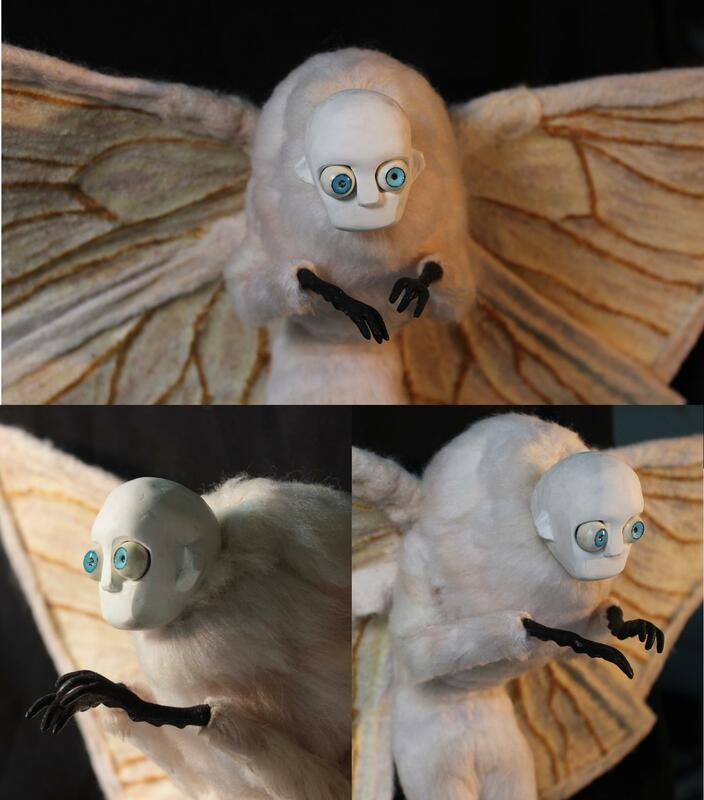 I used the same needle felting wool as for the fur on the body plus some darker colours to create the outside of the wings. Ony here it was felted into sheets which I fitted around the wing frames.